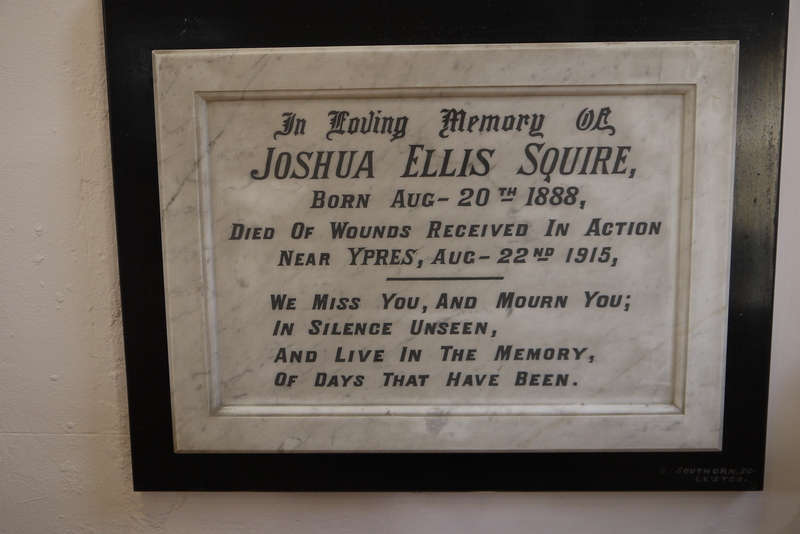 In the Leicestershire village of Woodhouse Eaves the Methodist chapel contains a memorial to Joshua Ellis Squire who died of wounds received in action shortly after his 27th birthday. The only other memorial plaque in the chapel is to someone who was a Steward for 50 years, so clearly Joshua was someone special: in fact he was a direct descendant of John Squire, one of the original trustees who built the original chapel and bought the land on which it was built in 1801, and of his son, another John Squire, who was the first named trustee when the second trust was set up in 1843. 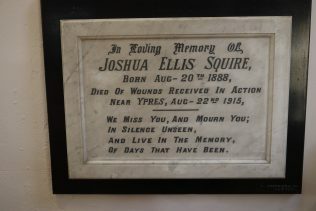 Joshua Ellis Squire was the son of Josiah or Joseph Squire and Mary Ann (nee Ellis) of Maplewell Road, Woodhouse Eaves. By 1911 he was working as a groom at Maplewell Hall, and continued to do so until he enlisted on 31st August 1914 at Mountsorrel. He joined the 5th battalion of the Leicestershire Regiment, landing in France on 28th February 1915, and dying near Ypres on 22nd August. He was buried in Brandhoek Military Cemetary.